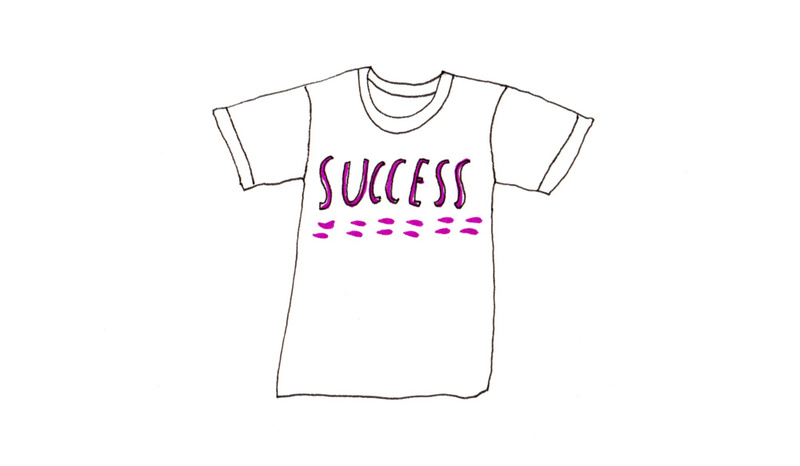 Happiness Project Reflection 4: What Does Success Look Like? How’s your summer going so far? I’ve been busy working, drawing, making block prints, and of course writing these blog posts! As I said before, I’m not a natural writer. It takes me hours to write these posts plus creating a title illustration for each post. But I’m proud of myself for setting a new goal and working on it! 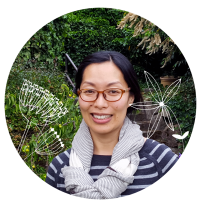 So today I want to talk about another reflection from my 365 Day Happiness Project. How do I know if the project was a success? When you’re an artist or anyone who shares your “stuff” online, it is very easy to get caught up in the numbers of “likes” or followers you get as an indicator of your success. Look at all the famous people you follow and admire. They have tens of thousands of followers! It sure looks like success to me. After all, if nobody knows who you are, how are you going to make money from your art, right? I recently read a couple of studies that talked about how our brains react to social media like an addiction. It’s so easy to get an instant gratification through the social media, and dopamine will keep you seeking more rewards. You anticipate the satisfaction of receiving the instant positive feedback that come in at random times. Easy access to information via our devices make it so easy for us to fall in to the dopamine induced loop. Do you check your facebook, twitter, Instagram, email or (fill in the blank) ALL THE TIME to see how many people liked what you just posted?? I’m certainly guilty of it. I want the validation. Here is what my loop looks like: Does what I create mean anything to anyone? Yes I know my family and friends think it’s cool, but what about other people? Do you like me? Do you like my stuff? Oh great, someone does. Phew. I can be at peace for the next 5 minutes. REPEAT. It’s a dangerous trap anyone could easily fall into. Although it is human nature to want external validation and feel good about yourself, it becomes an unproductive cycle when number is the ONLY thing you care about or it is the only way to measure how successful you are. When you set personal or professional goals, it is crucial to have an internal gauge to measure how you’re doing. Let’s look at my daily happiness project, for example. Did I draw and post my happiness illustration every day for 365 days? Yes! So that’s a success to me. I know this is a very simplified way of looking at it, but do you see how I had almost 100% control over the outcome? That is the key. When you leave your success up to random things like how many people will like it, it is very hard to stay engaged with your goals. What if I said my goal was to gain 10,000 new followers by the end of the project. I certainly didn’t reach that goal. Does that mean I was not successful? I would’ve felt less excited and proud even if I completed the same tasks. See what’s going on here? While it is important to gain and maintain followers for your work over time, let’s not put so much weight on the number itself to measure how successful you are or how good of an artist you are. By focusing only on the numbers, you’re placing your energy and time away from your real work. You could be practicing to get better at your craft. You could be brainstorming your next product ideas. Instead you’re going from one social media to the next every 5 minutes just to feel that satisfaction. And feeling sad and depressed when you don’t get as many “likes” as you did the day before. Instead of focusing on the numbers of “likes” and followers, you could focus on the quality of relationships you have with your followers. You can pay closer attention to them when your following is still relatively small. You would rather want to have a smaller group of really engaged followers than a huge number of followers who are not engaged with your content at all. It’s an opportunity afforded only to those who have a smaller, more manageable following. Take advantage of it while you can! People have different ways of managing their “habit” of checking their social media accounts constantly. I want to share some ideas and suggestions here! A lot of it has to do with removing the temptation and anticipation of instant gratification. Close your social media tabs on your web browser while working. Turn off the notifications on your apps so you won’t get distracted visually or by the sound. Schedule time to check your social media accounts intentionally. You can do once in the morning, once mid-day, and once at the end of the day for example. Put your smart phone on airplane mode if you need an uninterrupted chunk of time to focus. Check them when you’re intentionally taking short breaks. Indulge yourself as much as you want. But when the break is over, be in the “work” mode 100%. While I was working on my daily sketch project, I learned what would get more “likes” than others. For instance, cats (and other cute animals) got more positive response. Does that mean my other work are worse? Absolutely not. It just means those things resonated with more people. Be aware of the balance. If you like cats and that’s the only thing you want to draw, then go for it! But if you hate cats (or you want to be known for something else), don’t feel like that’s what you have to draw just to gain followers. At the end of the day, if you’re not being your authentic self, your audience will not be able to connect with your work. And you will be unhappy for putting yourself in that position! Another thing about shooting for a certain number of followers is – you will never be satisfied. At first 100 followers seem like a big number. Then you see other people with 1,000 followers. When you finally reach your 1,000, you notice people who have 10,000 followers. It just goes on and on. I also noticed that there are many, many talented artists who make 100% of their living from their art who don’t have a very big social media following. Or no social media presence at all. Do I consider them successful? Absolutely!! Yes, do appreciate when your following grows. Try to connect with them. But try not to make it the only thing that matters to you. Your success should be measured by your actions. Are you doing something every day to reach your big goal? Are you prioritizing things you said you valued? When you look back at your work from a year ago, can you see your improvements? If you can say yes to questions like these, you’re being successful. Make sure to recognize and celebrate small successes every day! 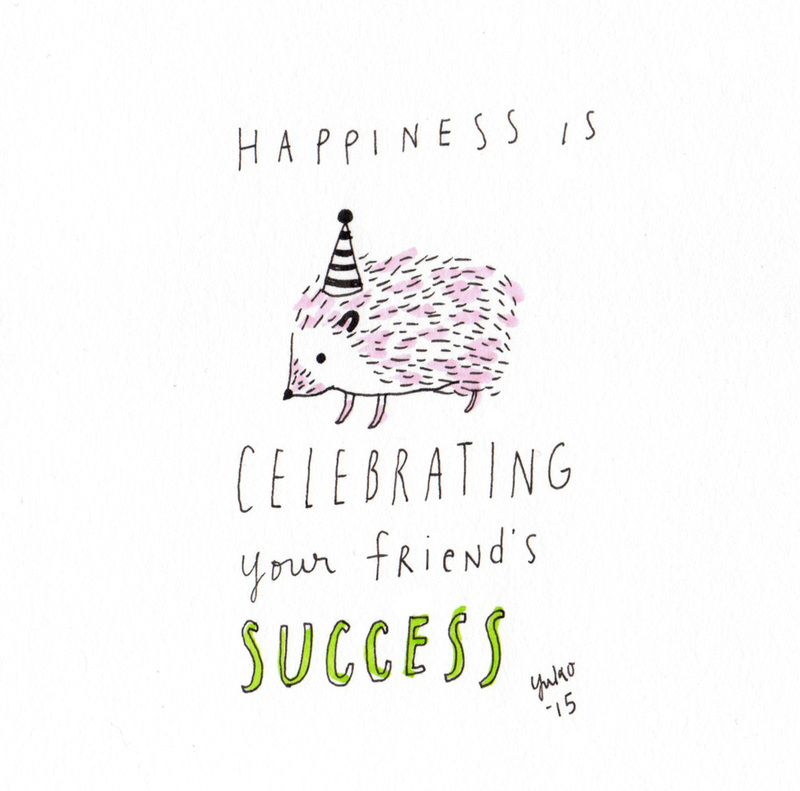 Day 356: Happiness is celebrating your friend’s success. Happiness is celebrating your friend’s success.